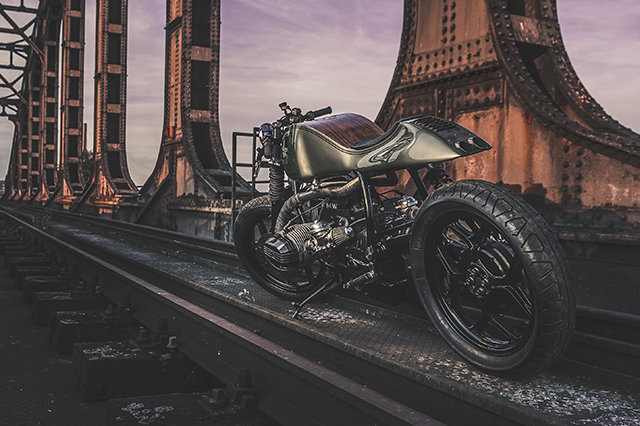 At first glance this is a café racer based on a BMW boxer obviously built by a talented team. 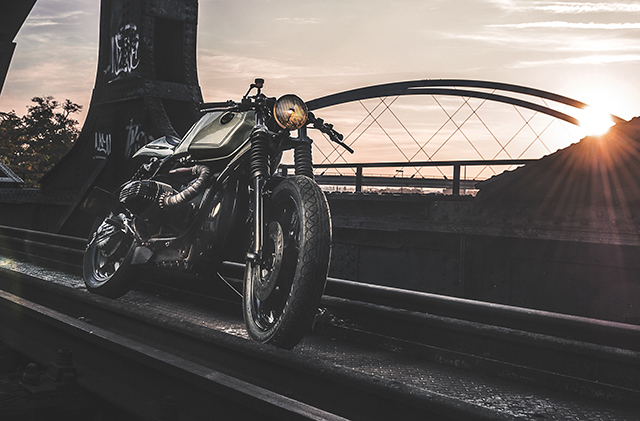 But as you take it all in you realise it’s builds like this that finally and empathetically make the statement that the elite of custom bike building is no longer exclusively a V-Twin domain. 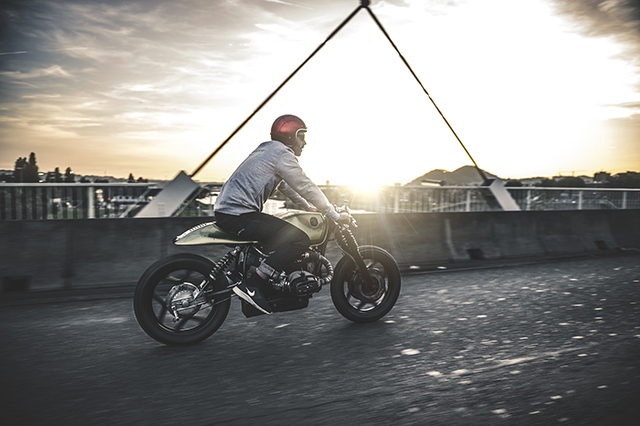 It’s no surprise then to see big names like Roland Sands and Marcus Walz turn their hands to Metric bikes. 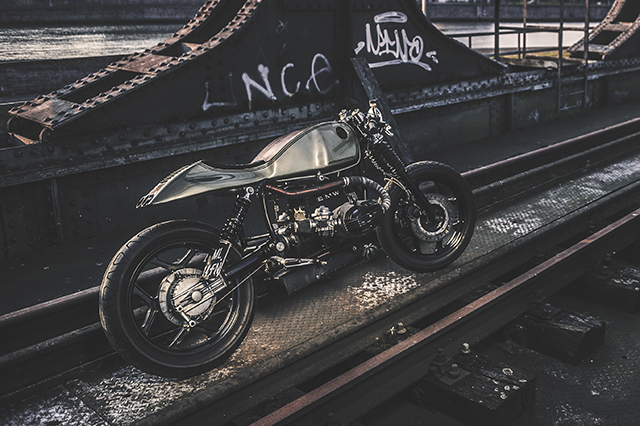 But this is what Lorenzo, Delano and Daniel from Nozem Amsterdam do, take metric, often unconventional bikes and turn them into elite custom creations. 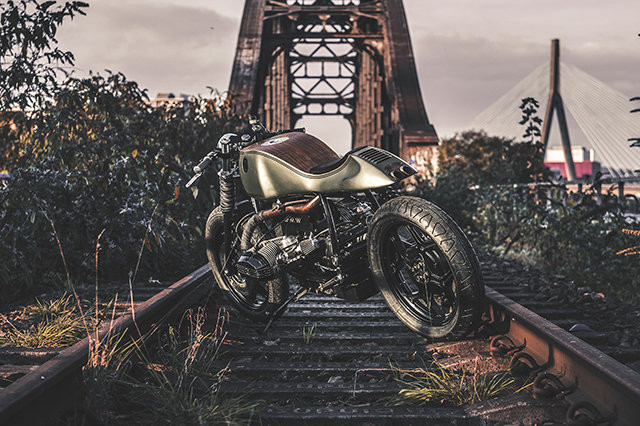 The basis for the build is a BMW R100 but to hear Daniel describe it you imagine he sculpted it with the caress one offers their lover “This is why we chose to give the lady a nice curved bottom”, well you can’t argue with that! So as to accentuate the best bits of the build the bike was stripped down and everything surplus to requirements thrown in the bin. The frame was detabbed and all the unnecessary brackets removed creating a smooth as silk look. It’s hard not to be instantly drawn to the one piece body work of the BMW, a feat rarely attempted and even less often successful. But as with everything they do Nozem wouldn’t rest until they were completely satisfied. The only remaining BMW bodywork is the front lower section of the fuel tank. The rest is entirely fabricated by hand, forming the sheet metal, offering it up and repeating until the lines were picture perfect. 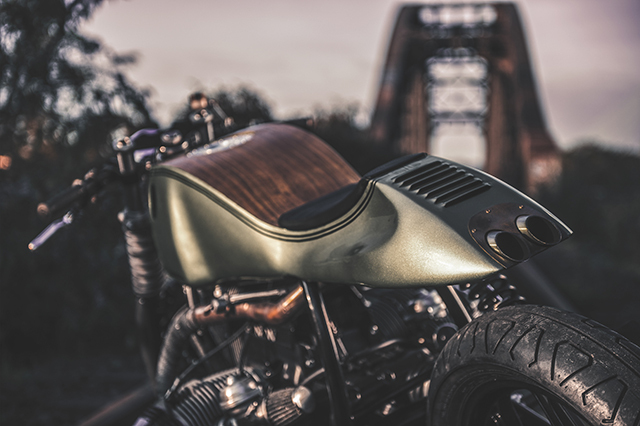 The timber top is crafted from the very best American Walnut and contrasts beautifully with the otherwise mean metal look. 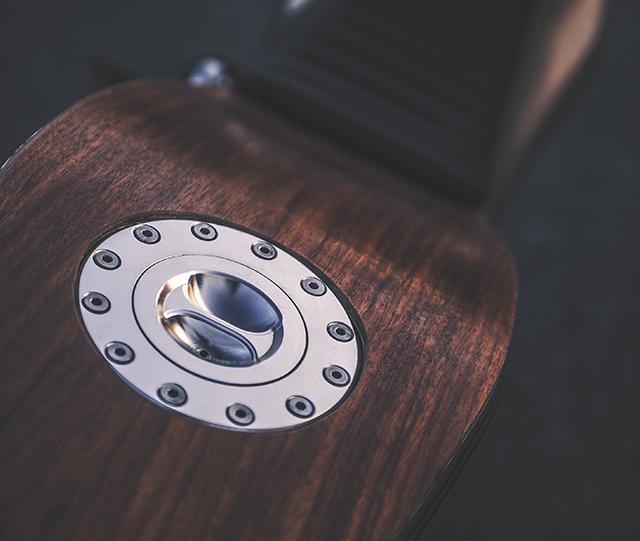 The inspiration for this step came from the Riva speedboats, the elite of the water world that also inspired the vented tail section. Exiting just below those vents is the hand built stainless exhaust that snakes its way from the Boxer headers to the rear of the bike cleverly diverted under the seat for an ultra-clean look. The exhaust has been heat wrapped at the headers and the engine is fed by pod filters but internally remains stock aside from some Nozem TLC. Without any silencing in the exhaust you can hear this classic lady coming long before she shows you her curves. Then there are the modern touches that are integrated into the bike rather than simply bolted on. The fuel cap is a race item taken from a BMW E30, while the levers are the ever popular Pazzo items. A small open ended spanner holds up the brake fluid reservoir and lighting her way is a small chrome headlight firing a yellow beam down the road. Like all Nozem bikes the wiring is entirely hidden, allowing nothing to interfere with the visual appeal the two graphic designers envisaged. The stock wheels are black and now visually become one with the tire; there are no socks and sandals here. While the paint work and pin striping only further enhance the lines of the BMW and her body. 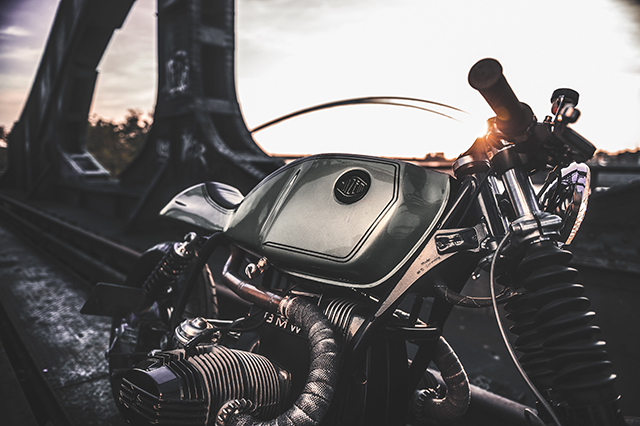 There is simply no need for graphics and flames with this level of craftsmanship but the Nozem badge reminds all just who fashioned these curves. 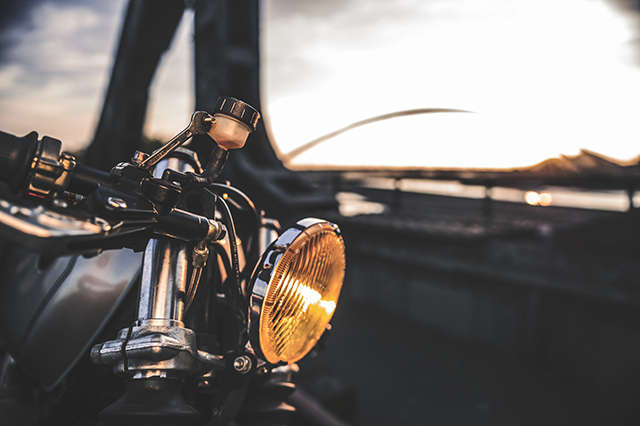 Dampening the ride of the hard leather seat is a Wilbers monoshock and no speedo will ever be fitted “eventually speed has to be felt not seen” explains Lorenzo. 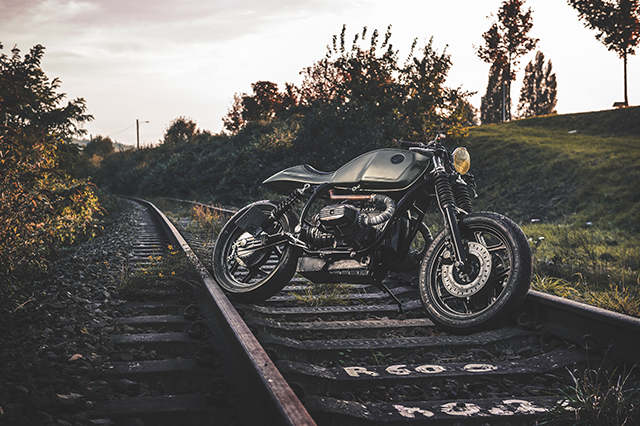 But it will be his best friend Daniel, owner of the bike, who will be the one to take this girl home, appreciate her lines and climb aboard to appreciate just what she’ll do.